Another opportunity to learn more on the Leap Manifesto. Climate Justice: How do we LEAP forward? Are you in Edmonton this weekend? Vote wisely. Not in Edmonton? Watch it all on the CPAC Feed http://www.cpac.ca/en/brightcove/?ls=93&l=en or on Rogers	97, 104 & 198 (E) or Bell FIBE TV 512. Seriously people—it's worth the trip to the west side Tuesday to hear Peter Tabuns, Cheri DiNovo, Avi Lewis, Joanna Kerr and many more important voices. This is a major town hall meeting discussing one of the most important issues facing our government, our society and our future. We hope to see everyone Friday night. Celebrating International Women's Day and fighting for women's rights all year. Distinctly wonderful announcement on International Women’s Day. Public Power in Ontario is going to be sold by the Liberals unless we all take a stand. Find out how we will stop this sell-off of our hydroelectric system. See you there! Passing along a notice of an upcoming webinar you may be interested in from Fair Vote Canada on Proportional Representation. Details: Sun, Feb 21, 2016 7:00 PM 7:00-7:20: Make Every Vote Count - Campaign 101 7:20-7:55: Unpacking Ranked Ballots Register: https://attendee.gotowebinar.com/register/8389464307873379841 What do the terms “ranked ballot” and “proportional representation” really mean? Which systems will deliver on our most important values and the promise to Make Every Vote Count? Are you new to the issue of electoral reform? Join our first section to learn more about proportional representation, and how it will build a more diverse and inclusive Parliament! If you already have a handle on the basic case for PR, jump on the webinar for the second section where Associate Professor and Canadian electoral reform expert Dennis Pilon will explain how ranked ballots are used in winner-take-all and proportional electoral systems - the options, the history, the objectives and the possible consequences. Fair Voting BC President Antony Hodgson will contribute to the discussion to explain how Single Transferable Vote (STV) could work as one option for Canada. You can attend the entire webinar, or you can join us for the section you are most interested in. Following the presenters, Fair Vote Canada will have Q+A where you can ask questions via a chat box. Fair Vote Canada will endeavour to answer as many as we can! Very interesting and important series of workshops, talks and events during Indigenous Education Week. Including a talk on the TRC from Wab Kinew (who just announced he will run for the NDP in the Fort Rouge riding in the upcoming Manitoba provincial election). The Hydro One Not for Sale campaign has 3 rallies scheduled for this week Monday at QP, Tuesday at TSX and Wednesday in the Beaches at Queen and Lee (Arthur Potts Riding). We would appreciate if all of you could come out and show your support at these rallies (see poster below) and if you could please circulate the poster throughout your networks, friends, neighbours, and pretty much anybody who uses electricity. "These are our families. Our neighbours. Our friends. Our community." —from today's email from School Trustee, Jennifer Story. Peter Tabuns, MPP, will be hosting this. Find out what is going on — and what we can do to stop this misguided privatization of our public hydro system. Concerned about the privatization of Hydro One? And the upcoming attempts to privatize our transit? Attend a planning meeting this coming Monday. Thanks again to all the volunteers giving, working and helping to make Toronto–Danforth a special part of Canada. And a special thanks to Craig for being an MP that we are all proud of. What is the deal with Liberals and energy? From cancelled gas plants to dubious plans to sell off a publicly owned utility to shady dealings on pipelines and lobbying even before elected? 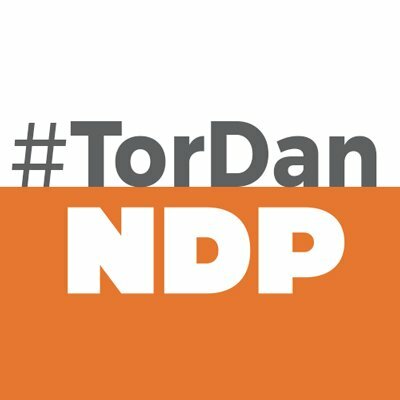 The NDP has committed itself to repealing C51. What a great day for a canvass. Today at 3 pm. Join Craig & Fred and CUPE. Come canvassing with Stephen Lewis. You can help to Re-Elect Craig Scott. The weather in Toronto-Danforth is forecast warm & sunny — so come on down to the campaign office at 1pm to hear Stephen Lewis & Craig, and then go through the neighbourhood. The NDP posters in the TTC are different. On these posters—reading the fine print makes them even better! Great neighbourhoods are what makes Toronto-Danforth a great place to live. One of those is the Pocket. The annual Pocket Street Party was Saturday. And Craig Scott had a great time meeting the community. And yes, he had some pie. Practical, principled, progressive economic management. Why were Craig Scott and the Toronto-Danforth crew handing out leaflets at Broadview, Pape, Donlands and Greenwood stations? Because Toronto needs Better Transit and the preditctable funding the NDP will deliver. Facebook 'likes': Are the Conservatives buying them? Do you have your Craig Scott sign yet? Call (416) 900-3725 and order yours today. Or stop by campaign headquarters at 661 Danforth Avenue, on the corner of Pape & Danforth. NDP Volunteer Video - "Working Together"
The Rally for Change tonight in Toronto had a jam-packed room; many, many standing ovations; and a rousing speech by Tom Mulcair.